Refutations: Qadiani Marriages – Ahmadi Cult ? Lately, there have been an increasing number of posts across the internet about the state of marriage within the Ahmadiyya Muslim community. Firstly, of what concern anybody’s marriage is to anyone except for the parties directly involved is beyond me! Seriously, do these posters have nothing better to write about than marriage within the Ahmadiyya Muslim Community? Secondly, do they have so little regard for Almighty Allah and His Prophet (sall Allahu ‘alayhi wa sallam) that they repeatedly ignore that ”ghibah” (back-biting) and ”namimah” (malicious gossip) are sins and in many cases major sins? Take note, as I have already explained, the acts of ”ghibah” or ”namimah” involve telling a true fact about someone else. So it simply does not cut mustard to say: ”But what I said about that person was the truth, I didn’t lie – honest…” If you lie then you have committed slander – a completely separate act and sin. Also, posters must be careful when they level accusations against others as they sometimes unwittingly (maybe even negligently) leave others open to criticism. A simple example would be to infer that if someone is divorced then he or she must be morally deficient or of suspect character. Once a standard is created it then has to be applied universally. No less than Hadrat Abu Bakr al-Siddiq (radi Allahu ‘anhu) and one of his wives (the mother of the amazing Hadrat Asma’ (radi Allahu ‘anha)) divorced. Therefore, according to the – highly suspect – standard here created, there must have been some sort of problem or shortcoming in Hadrat Abu Bakr (radi Allahu ‘anhu) – may Almighty Allah protect us from individuals who negligently ignore Him and His Beloved (sall Allahu ‘alayhi wa sallam). I am not sure about the reader’s perception, but the more and more that I write on this blog, the more concerned I become about the state of some of our Muslim brothers and sisters (note that I said some and not all – that is called ”not generalising”). Really, why can people not simply step aside and live their lives however they want to without feeling the compulsion to vilify and attack others? 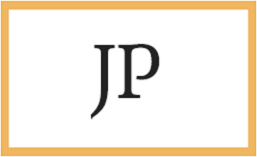 It is my sincere prayer that this will be the eventuality and there will no longer be a need or purpose for this kind of blog. Imagine that – I could be spending this time reading or even start a new blog wherein peaceful and like minded individuals could share in their love for Almighty Allah and His Prophet (sall Allahu ‘alayhi wa sallam). Question: ‘’1. 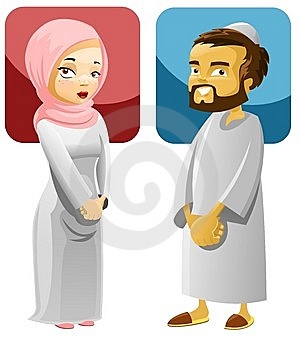 Can a Sunni woman marry an Ahmadiya (Qadiyani) man? 2. What if a Sunni woman has married an Ahmadiya (Qadiyani) man. What is the ruling and what she has to do to get back to the fold of Islam? 1) He claimed prophet hood. 2) He claimed to receive wahy. 3) He claimed that the previous divine scriptures predicted of his prophet hood. 4) He claimed having a miracle greater then that of Nabi Nooh(alayhi salam). 5) He use be mock and belittle previous Anbiya(alayhimus salam). 6) He use to swear at Nabi Isa م(alayhi salam). 7) He claimed Sayyidatuna Aisha رضى الله عنها committed adultery. Fatwa: ‘’As-Salamu `alaykum: Ahmadis are considered non-Muslim and it is required that this boy first declare his Islamic belief before Sunni witnesses and abandon Ahmadi beliefs, after which the marriage can proceed. Otherwise, no. This should appear clearly to you through istikhara. 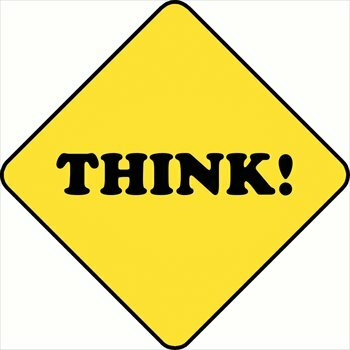 Ahmadis are considered non-believers because they reject one of the obligatory articles of the Religion of Islam (daruriyyat), namely, the fact that the Prophet Muhammad is the last Prophet and that there is no new Prophet after him whatsoever, upon him blessings and peace, which constitutes belying the Qur’an (takdhib al-Qur’an) according to the Consensus of the Muslim Umma. They also profess to follow a person from Qadyan as their leader who was declared an apostate (murtadd). So to love an Ahmadi and be loved by him is like saying: You question the truthfulness of my Lord; and/or you corrupt the Book of my Lord away from its meaning; and/or you divest my Prophet of his attribute; but I love you and you love me…..?? You know what though? Fair enough, they have a right to write and advise whatever they feel fits within their understanding of the texts. I just think that before anyone should dare to lecture Ahmadis about marriage, they should first look inwardly. This entry was posted in Allegations, Misc, Refutations, Uncategorized and tagged ahmad, ahmadi, ahmadi girl, ahmadi marriage, Ahmadiyya, ahmedi, Aisha, al-wasiyyat, ansar, attacks, back-biting, caliph, Censorship, chanda, converts, cult, da’wah, death, Deception, deenport, divorce, fabrication, fatwa, finance, flesh, ghiba, ghibah, girls, henna, islam, Jalsa, jihad, khalifa, khilafah, khilafat, khuddam, lajna, leadership, marriage, mehndi, Mirza, money, namimah, nikah, numbers, Propaganda, Qadian, qadiani marriage, qussas, rishta, Suyuti, tableegh, uk, waqf-e-jadid, wasiyya, west million, women, zakat. Bookmark the permalink. This only shows that Non-Ahmadi show that marriage to ahmadis is not permitted but the Ahmadis force not to marry non-ahmadis by saying that if an ahmadi marries a non-admadi than he/she will be kicked out of the jammat ALONG WITH HIS FAMILY so is this fair. Non-Admadis only say that it is not permitted but they dont tell you to become an Ahmadi if you marry an admadi person and they are not even stopping you so think of it first and please use your sense before blaming others. The rest of this video is also inciting hatred, falsehood and false allegations against the Ahamdiyya Jama’ah. So I ask you, who is acting in the most Islamic manner and following the example of the Prophet salAllahu alaihe wa sallam? Who is spreading rumours and malicious gossips? The above quotation so clearly shows that the non-ahmadis are the ones who themselves are stating that marriage to ahmadis is invalid – so how hypocritical is it to make allegations that it is the Ahamdiyya who are not allowing marriages to those outside the Ahmadis. Listen to your own shayukhs and to their fatwas, before you start raising fingers at the Ahmadiyya Jama’ah. This is simply being honest and fair. 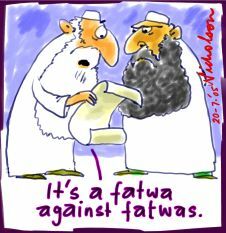 Each fatwa is pasted in verbatim and linked back to the original source. The only point being made here is that it hardly seems fair that Ahmadi Muslims should be vilified for being too harsh when the scholars of those vilifying them adopt an even stronger stance than the Islam Ahmadiyya one. Seems honest and open to me. This sounds like usual qadiyani talk!! !